I have to admit I had no idea what a Kir Royale was, so I had to Google it to find out that it’s a cocktail Crème de Cassis and Champagne and these crisps actually do contain Crème de Cassis, Cognac Oil and Prosecco powder in the ingredients. 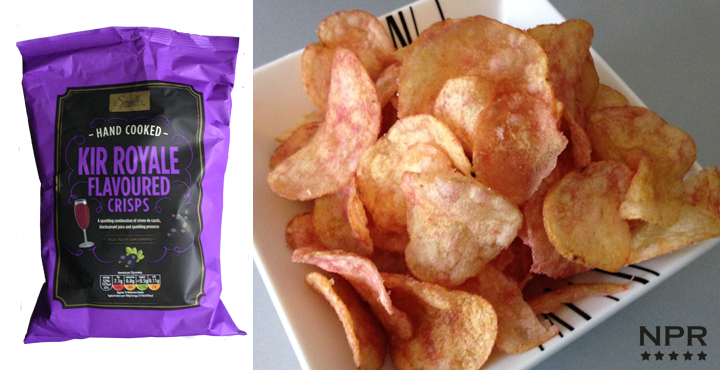 The first thing that you notice with the flavour of these crisps are the tingly sensation that these crisps give you on the tip of your tongue followed by a blackcurrant berry taste and then followed by the potato crisp aftertaste. These crisps are part of the Aldi Specially Selected Hand Cooked range so the potato crisp taste and quality is there in the background taste and crispy and crunchiness. Its a strange mix of flavours,(like blackcurrant juice and cream cheese) not exactly to my taste and one of our testers in the office remarked that it was like having sick in your mouth. I don’t think its as bad as that but I have to admit I’d be hard pressed to buy another pack even at its currently discounted price. Potato(66%),Sunflower Oil(26%), Kir Royale Flavoured Seasoning(Rice Flour, Sugar, Blackcurrant Juice Powder, Acids: Malic Acid, Citric Acid; Sea Salt, Acidity Regulator: Sodium Carbonates; Natural Flavourings, Cognac Oil, Creme de Cassis, Prosecco Powder. LIKE HAVING SICK IN YOUR MOUTH, WEIRD TASTES.